This year, 2012, is one of great importance. It is essential that the impetus of the Arab Dawn, and its repercussions worldwide, be not lost. The Voice of the People, so vigorous and confident now, must continue to ring out through all the world, affirming Sharing and Justice as the only way to engender trust and a safer world for all. The remedy for men’s ills is so simple, so easy of achievement, yet so difficult for many to grasp. Men must realise that every other method has been tried and has failed, ending inevitably in war. Today, let all be assured, another major war would be nuclear, and would destroy, utterly, all life on Earth. Today, also, there are forces who are already planning how best to survive such annihilation, all to no avail. What can, and should, humanity do? Broadly speaking, the governments today are organisations of elderly men who know no other way to work and govern than the ways of their youth, the ways of the past. They have little sense of why their methods no longer work. They know nothing of the new energies and impulses which flood the world today, and are baffled and betrayed by their inability to control events. To a large extent, today, the People’s Voice is the voice of the young. Governments, and the media under their control, largely ignore or vilify the voices and aspirations of the young; yet it is the young who have the answers, who understand that humanity is One, who call for fairness, for justice and sharing, and an end to war. The voice of such young people can never be silenced, and will not for long be ignored. The Voice of the People, young and old, will drown the whimpers of the men of money and lead humanity to the New Dawn. So will it be. Q. How many television interviews has Maitreya now given? A. 59 (as of 10 March 2012). Q. (1) Were recent interviews still in Brazil? (2) Do the interviews with Maitreya in Brazil all take place in Portuguese? Q. Has He appeared on Japanese television yet? Q. The unusual solar flares taking place now must surely be having some sort of energetic effect on the world? Or is the impact only physical such as dramatic changes in weather patterns? A. The effects are on both the physical and the mental planes. Q. The planets Venus and Jupiter are closely aligned at present. (1) Does this conjunction have an influence on our planet? (2) What sort of influence is it? Is it positive? A. (1) Yes. (2) Yes, very. Q. What sort of behaviour is destructive within a group? A. Any sort of behaviour that interferes with the working harmony of the group. Q. Years ago it may have been true that Iran was not developing nuclear weapons; is it the case that after years of being badgered and threatened by neighbouring countries it finally felt the need to go ahead and develop a nuclear arsenal? A. Yes, with the constant pressure and trade embargoes by the United States and above all, the fact that Israel has the nuclear bomb and has threatened to use all its capabilities, Iran feels now that it has little choice but to, even if reluctantly, have nuclear capability of self-defence. Q. Which countries in the world form the biggest threat to world peace – in the eyes of the Masters? A. (1) Israel. (2) Iran. (3) United States. Q. The Master Djwhal Khul advised aspirants to learn to “sit lightly in the saddle”; could you elaborate on this advice? Why is it important? A. The English term, “to sit lightly in the saddle” means to be more relaxed. Too many aspirants are over intense and take every aspect of life very, very seriously indeed and think that everyone else should do likewise and are very hurt if others are not acting as they are. Were they to relax a bit and to “sit more lightly in the saddle” they would more quickly become useful, practical disciples. Q. Is there a way to develop the intuition – like the ‘siddhis’ are said to help develop certain psychic or spiritual abilities? A. The intuition is a soul quality. The soul knows because it knows, it doesn’t have to think by any rational method, as does the lower mind. When a person, through meditation, has reached the point of close infusion with the soul, the intuition naturally develops at the same time. Q. Is there a danger of a nuclear war at present? A. While nuclear weapons exist and while governments compete and take up belligerent positions against each other, the possibility of nuclear war is always there. But do I think that there is a danger of a nuclear war at present? I would say, no. Q. 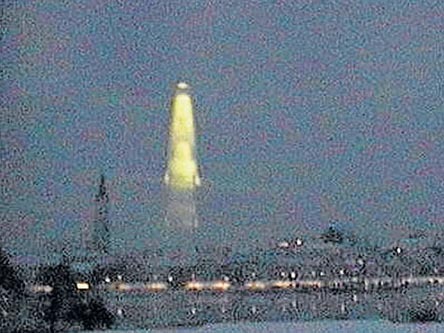 A number of video “experts”, along with the largest UFO investigation group in the US, have declared the videos of the appearance of Maitreya’s ‘star’ over Jerusalem in January 2011 a hoax, without bothering to locate or interview other eyewitnesses. Would your Master kindly tell us how many people actually saw the ‘star’ over the Temple Mount that night? Q. You have said the four ‘star’ UFOs are the size of five football fields, but the photo of the ‘star’ over the Temple Mount published in Share International shows it appearing significantly smaller. Do the Space Brothers manipulate the size of the ‘star’ UFOs along with their shape and colour? Q. Former Czech President Václav Havel, was known as an advocate of freedom, human rights, justice, truth and love for all. (1) Was he aware of Maitreya’s presence? (2) His death evoked the spirit of unity and freedom, felt during the velvet revolution in 1989, and his funeral ceremonies brought thousands onto the streets and many more watched it on TV. It was all very moving and totally changed the usual busy atmosphere of the Christmas shopping season. This momentum and the energies evoked brought people to a standstill, made them think on other realms, review their life and destiny from a higher perspective. Was there something extraordinary in those events? Q. More than a year-and-a-half on, there has been no follow-up to the story about the discovery in India of a prehistoric cave painting depicting UFOs and a space-suited being, which your Master confirmed is thousands of years old. Apart from the usual paranormal and UFO websites, no major news agency ran the story. (1) Was the story ignored because it seemed too outlandish and implausible for editors to accept, or, (2) has it been censored because of its explosive implications and threat to the UFO cover-up? (3) Is the painting or the cave in any danger of being deliberately defaced or destroyed? A. (1). Yes. (2) No. (3) Not as yet. Q. Your Master once said that about one-third of the people who have been executed in the United States Justice System have been innocent. A man named Troy Davis was executed on 21 September 2011 by the state of Georgia for allegedly murdering an off-duty police officer in 1989. Before being put to death Mr Davis said: “I am innocent…. All I can ask ... is that you look deeper into this case so that you really can finally see the truth. I ask my family and friends to continue to fight this fight.” Even though the life he chose was not very positive there is lingering doubt as to his guilt. Was he truly innocent? Q. The World Bank recently announced that the percentage of people living in extreme poverty (less than $1.25 per day) had been reduced in all areas of the developing world during the years 2005-2008. In addition, the World Bank said preliminary figures also indicated that the percentage of people living in extreme poverty in 2010 was less than half the percentage seen in 1990. (1) How accurate are these reports by the World Bank? (2) Is extreme poverty declining as the World Bank says? A. (1) Not accurate. (2) On the contrary, there are more people in the so-called ‘developed world’ suffering from ‘new poverty’, from loss of salary, loss of home, etc. In the USA, Japan, Europe, the number of people entering poverty is increasing. Money too is increasing, but it is going to the people who have it already. The World Bank is only measuring the wealth in the world, but the distribution is as always to those who have. The rich are getting richer, and the poor are getting poorer, so there are more poor in the developing world and more poor in the developed world, especially America, Europe and Japan. Q. What does nuclear pollution do to the etheric body? A. It breaks down our immune system, leaving us open to epidemics of all kinds. On 27 February 2012 during a coffee break, three of us who were working at the Share International/Nederland information centre in Amsterdam were talking about how the Masters help us all in so many ways: as teachers, healers, therapists, nurses, guides, inspirers and always give exactly the help that is needed in exactly the right way required by each person with her/his specific needs at that moment. We also talked about the need for faith and how by working you grow to know. A few minutes later we saw a man standing looking at the books in the window; he came in, forthright, happy, relaxed. Speaking Dutch, he shook hands with each of us, introducing himself. “This information appeals to me,” he said. “What do you do here?” Jos began to tell him about the emergence of Maitreya and the Masters. However, it quickly became apparent that he knew our information. We were already pretty sure that our visitor could be the Master Jesus. He said he was an artist – that is to say an actor, singer, poet. Corné, listening to the conversation, noted that the lively, smiling young man (of about 30 something) with a natural authority, finished Jos’s sentences; that he filled in the word “Rome” when Jos said the Master Jesus is now based in … Rome. We chimed in: Yes, it’s sharing. He went on to talk about the social problems with youth of immigrant descent. It was true, he said, that they caused problems, but why? The cause of the problem lay partially in the home but also in society – the inequality and again the tension and the pressure on the family. He talked about a controversial right-wing Dutch politician, saying that the people who vote for him aren’t racists but it’s a protest vote – since everyone has lost faith in the main parties – the one being just as bad as the other, with no solutions to the current problems. He was concerned about the situation in the Middle East, specifically Israel and the situation with Iran. He mentioned Syria and said that the world cannot afford a war. It would be terribly destructive. We asked for his advice. “Well, make a simple flyer – not complicated. Organize more events – in the evenings. And, one last tip, when you organize an event always include food. Eating together brings people together – it has a binding effect.” Then he laughed really heartily and said that he’s a good cook and he would come and help us! He shook hands and left saying he would be back again. Was he indeed the Master Jesus? J.K., C.Q. and F.E., Amsterdam, the Netherlands. On Sunday afternoon, 29 January 2012 I decided to make a walk to get some fresh air. I felt a bit uneasy and lonesome, as I had no possibility to talk to somebody the whole day so far. Knowing that fresh air and movement would help me to overcome the situation I made that walk. After some time I saw a young, very tall man with a colourful woollen cap on his head coming in my direction. I saw that he had sparkling eyes and he greeted me in such a warm and cheerful manner, that I suddenly felt very happy. I was astonished to get such a nice greeting and smile from a young man as I am approaching my 70th birthday and am no longer a young attractive girl. The good feeling remained for a long time and even now, my thoughts often go back to that wonderful moment. I wonder if that person was somebody special or just a nice young man? I am a semi-regular listener to Robert Elms’ BBC Radio London programme. Once a week it includes a feature entitled ‘Notes and Queries’; a forum for Londoners to ask questions about unusual landmarks, curious old buildings, strange statues hidden away in off-the-beaten-track locations, even what happened to a much loved street character who hasn’t been seen for a while. No matter how obscure the subject one or more of the listeners always knows the whole story, filling in names, dates, history, everything you could possibly want to know. I guess you’d put it down to the wisdom of the crowds. Many theories were offered to explain who could possibly be announcing their return in such an extravagant style. Was it a conceptual art installation? Could it be a Ken Livingstone mayoral election poster? Perhaps, someone joked, it could be the late great American soul singer James Brown? His song, “Get up offa that thing,” starts with several emphatic “I’m back”s. Time was running out, the faultless record of the collective brain of London was at stake. Exasperated, Robert Elms suggested that maybe it was Jesus who was back. A local church was contacted but denied any responsibility. The only lead was an eyewitness account of the sign being put up by two long-haired, bearded men dressed in flowing robes. In the end the case had to be declared unsolved. Was this sign one of the ‘signs of the time’? R.K., Charlton Kings, Weybridge, Surrey, UK. On Friday 6 January 2012 after our morning Transmission Meditation group ended I went for a walk before returning to my office for work. The morning was mild and I was worrying about global warming as I walked and feeling rather heavy about the state of the world. Then he continued serenely on his way pedalling his bicycle and holding onto the rug all the while maintaining perfect balance. I was struck by his graceful demeanor. Could this gentleman have been someone special? Was it from Him? If so, can I use it for His blessing, meditation, and healing of myself and others? 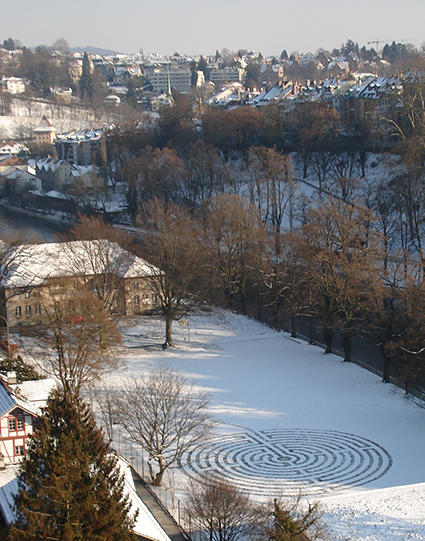 On 4 February 2012, from the Kornhaus-Bridge, in Berne, I discovered a beautiful snow circle, at the same place as the first one which appeared in December 2008 (see Share International, April 2009) and the second in December 2010. Apparently the 2012 more complex snow pattern is an exact copy of the labyrinth (maze) in Chartres Cathedral. Since the snow melted in late February however, the pattern remains imprinted on the grass, and is attracting thousands of people to look at it from a nearby bridge. Snow pattern viewed from the Kornhaus Bridge, Berne, February 2012. 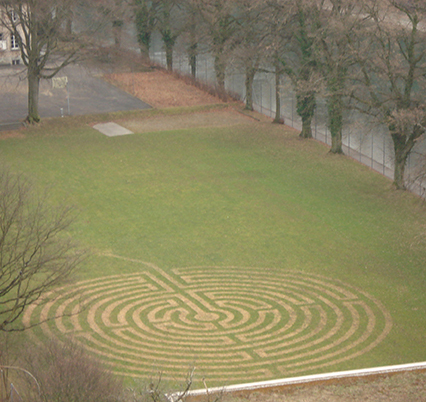 Grass pattern viewed from the Kornhaus Bridge, Berne, late February 2012. 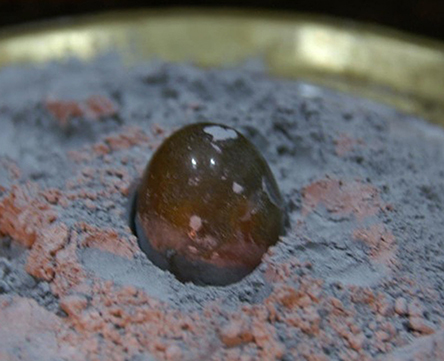 A large Shiva Lingam materialised at Sri Premananda Ashram at Trichy, Tamil Nadu, India, on 20 February 2012 at 10.15pm, during the Hindu festival of Mahashivaratri (the Great Night of Shiva). The lingam (a symbol of creation) appeared near the shrine of the Shiva Shakti Temple where Swami Premananda’s Samadhi (spiritual tomb) is located. A similar sized lingam materialised at the Ashram a year ago following Swami Premananda’s passing on 21 February 2011. (See Share International April 2011). We present a selection of quotations on the theme of ‘The Evolution of Humanity’ from Maitreya (Messages from Maitreya the Christ), Benjamin Creme’s Master (A Master Speaks), and Benjamin Creme’s writings. … deep within the consciousness of every man, woman and child lies the awareness of being a soul. As progress upon the evolutionary path is made, that certainty deepens, the conscious link between the soul and its reflection strengthens, and the light of the soul the more readily is contacted and known. Thus the light of understanding grows. The moment our soul sees that we are ready to begin to express, somewhat, its perfection; to bring the qualities of the soul – truth, beauty, intelligence, the longing for perfection itself – into the incarnational process, the true evolution of the man or woman begins. The time when that happened in each individual case determines our point in evolution. For long ages, the dominance of matter precludes a major expression of the soul; evolution proceeds but slowly. When, at long last, the opposing poles of his nature are resolved, man realises that the dichotomy is but seeming, the oppositions unreal. Then he sees that all is One, spirit and matter but two aspects of one divine Whole, the limitations of the past naught but illusion. We have to reach a point where what happens to us is not all that important; what other people think about us, not important at all; what other people say to us and however they vilify us, not important, easily overcome. We have to be able to take criticism and not criticise. If we were to put everything in one word, detachment is the key to the process of evolution. My intention is to place before you the answers to man’s dilemma, to show you that the future holds for all men unbelievable promise. With My Brothers, the Masters of Wisdom, I shall show you the way to release your divinity and receive your inheritance. “We did not create this crisis but we are paying for it in every sense,” said the students union’s leader Tohil Delgado, who complained about overcrowded classrooms, lack of funds for central heating or library services, and the thousands of teaching jobs which have been cut. “They are making cuts in public education, they are giving us no option to work, and on top of this, when we protest democratically, they beat us with complete impunity.” Tensions ran high when the police charged a group of teenage demonstrators in Valencia, insulting them and beating them with truncheons. Police agents called the students “the enemy” and that triggered a backlash – from students and their parents – against the police, with posters and cries saying “We are the People, not the Enemy”. Worldwide demonstrations took place on 10 March 2012 to commemorate the 53rd anniversary of the 1959 Tibetan uprising against Chinese rule and to remember the Tibetans who have set themselves on fire to protest China’s violation of their freedoms of religion and expression. In the last year, 28 Tibetans, most of them monks, have set themselves ablaze to protest China’s rule. Protests took place in about 30 countries including the USA, the Philippines, Brazil, Australia, Ukraine, Japan, Spain, India, Russia, the UK, Canada, France, Germany, Mexico, Netherlands, Portugal, Sweden, Belgium and Denmark. In Taiwan’s capital city Taipei, hundreds of people carried model coffins covered with Tibetan flags and photographs of the Tibetans who have self-immolated since March 2011. Carrying banners saying “Burned for Tibet” and “Immolated for freedom,” they marched through the city. Once the parade reached Sun Yat-sen Memorial Hall, they lay down on the road in silence for three minutes in memory of Tibetans who had sacrificed their lives for the Tibetan cause. “When you lie on the street, think of the Tibetans who fell on the soil of Tibet because they were shot by Chinese troops as they took to the streets calling for freedom, just as we are doing now,” an organizer said. Demonstrations took place in cities all over the USA. In New York, 2,000 people marched on the UN headquarters, and ended the march with a candlelight vigil at Union Square. “We want the freedom of Tibet and the return of the Dalai Lama,” said Sonam Gyatso, vice president of the Tibetan Community of New York and New Jersey. In another New York demonstration three men have sat, in all weathers, under a Tibetan flag, in a small park across from the United Nations, since 22 February, on a water-only fast. One of the protestors, Shingza Rinpoche, 31, a prominent Tibetan monk, left his homeland to live in India, but recently came to New York in solidarity with his countrymen. He says the group has sent a petition to the United Nations with five demands, including a request for a fact-finding mission into the critical situation in their homeland, where even a young mother recently set herself on fire. Like those in Tibet who have already taken their lives, the three men are willing to sacrifice themselves and hope the world will soon wake up to their plight. The United Nations says it has received the Tibetan’s letter and is looking into the matter. Les indignes – the ‘indignant’ movement in France is planning a widespread campaign of protest. 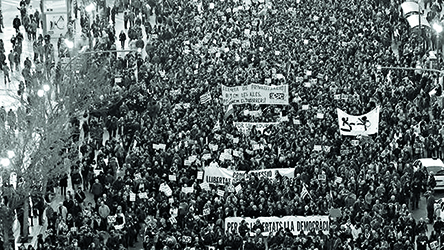 Like their counterparts in Spain – Los Indignados, and the Occupy movement which has spread to many parts of the world les Indignes represent a demand on behalf of millions in France who are suffering from increasingly painful austerity measures. Their ranks include people of all backgrounds and walks of life; what unites them is a determination to oust corrupt, self-serving leaders and moribund systems. They demand an end to the old regime which they reject as no longer representing them. Numerous protest marches have been organized to start from cities across France; the plan is that the marchers will converge in Paris just before the first round of voting in the presidential elections. 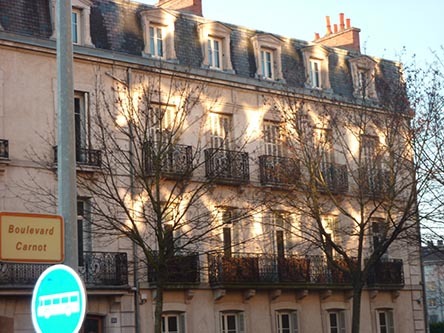 The walkers have already started and are advancing on the French capital from cities like Bayonne, Lille, Marseille, Toulouse. They will arrive in Paris on 21 April 2012. Spanish youth – many of them high school minors – took to the streets of Valencia (eastern part of Spain) to protest against austerity measures. Few today would argue with the fact that nearly all human institutions appear to be in parallel crisis. Charles Eisenstein is a philosopher, teacher and author whose latest book, Sacred Economics: Money, Gift, and Society in the Age of Transition, traces the history of money from ancient gift economies to modern capitalism, revealing how the money system has contributed to alienation, competition, and scarcity. In line with esoteric thinking he suggests that humanity is now making a transition away from a cultural identity that defines human beings as separate, discrete entities in competition with each other for finite resources, to one that expresses the connected relationship between ourselves and other human beings, and ourselves and nature. He presents an idealistic vision of how living without society’s over-riding focus on money would transform our sense of self and our relationship to others: a change in sensibility. He talks of “The self of ‘inter-beingness’ that understands that we’re the same being, looking out through different eyes; that what I do to you I’m really doing to myself; that your well-being is connected to my well-being; your suffering is connected to my suffering”. As our institutions fall apart, Eisenstein says that they are, in effect, ‘birthing’ us into a new world. In considering this new world, Eisenstein asks: “What would a money system look like that was aligned with the connected self, and in co-creative partnership with Earth?” He advocates the shrinkage of money to a far less prominent role in our society, in conjunction with the restoration of what he calls the “gift realm”, in terms of both social relationships and of the “commons”, the gifts of nature. Meeting each other’s needs in the form of gift exchange and peer-to-peer economics, would engender a sense of connection and empowerment, and at the same time diminish the current economy of alienation and separation. The internet itself, he suggests, is largely the work of a burgeoning gift culture. Giving, Eisenstein asserts, is fundamental to human nature; everyone is born with the desire to give. He reminds us that all human beings begin their lives as helpless infants, dependent on gifts to survive: “One doesn’t do anything to deserve being nursed; one doesn’t earn one’s milk. One doesn’t earn being clothed, being taken care of and loved. Human beings don’t earn having a planet that can support life, or having soil that can grow food. It’s all a gift.” As a natural result of these recognised gifts, we are inclined to respond with gratitude and the desire to give in turn. The idea of a gift-based economy appears to contradict everything that current economic theory says about work: that people will only work if paid to work. As Eisenstein puts it, “it forces one to give their gifts”. He sees human nature differently. He says: “If you’re in a life, a profession, or a relationship where you’re not giving your gifts or where your gifts are not being received fully, you’re not going to be happy. You’re going to feel, ‘this isn’t my life. I wasn’t put here on Earth to do this." Charles Eisenstein, Sacred Economics: Money, Gift, and Society in the Age of Transition. Evolver Editions, USA, 2011.